As you probably know from first hand experience, when it comes to eating healthier, change is really hard if you’re relying on will power. This is because we only have a finite amount of willpower each day. As the day wears on, our will power reserves get depleted which is why it can be so difficult to exert self control when we’re tired. So what’s the alternative? Habits. By focusing on building healthy everyday habits, you automate your decisions. This way eating healthy isn’t something you battle with at every meal, its on autopilot so healthy choices become effortless. I grew up on a sheep farm and the closest supermarket was a 40 minute drive away. So the concept of a well stocked pantry is something that comes naturally to me. Just the knowledge that I am prepared saves a heap of stress AND it means I can usually find something to make, even on nights when I feel like I don’t have the energy to cook. 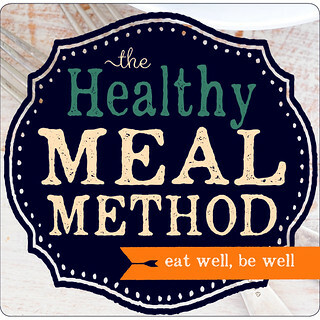 We’ll be covering a detailed step-by-step guide to setting up and actually using your life-saving pantry / fridge / freezer in the Healthy Meal Method which I hope you’ll join me for. There’s a ‘secret’ weapon I’ve discovered for avoiding waste, an idea I stole from the restaurant world. Chefs call it ‘mise en place‘ but I think of it as ‘investment cooking’. It’s where chefs prepare ingredients up to the point where they’re ready to be used during food service. It may be as simple as washing and chopping vegetables. Or more complicated like roasting veg or cooking up a big pot of lovely lentils. The main benefit in a restaurant (and your home!) is that it makes it quicker and easier to get food on the table after the customer has ordered (or got home from work!). It also usually extends life of fresh produce. This is a key component to the ‘Healthy Meal Method’ which is why I’ve included step-by-step plans to get you into the habit of ‘investment cooking’ on a regular basis. And the best news is, it can take as little as 1/2 an hour a week to make all the difference. They say there are 2 types of cooks: those that like to follow recipes and those that consider a recipe to be nothing more than a gentle suggestion. These days I’m definitely a recipe-is-just-for-inspiration type of cook. But it wasn’t always the case. When I first started to get into cooking in my early 20s I always followed the recipe. As my confidence grew, I began to tweak a few things here and there. Then during my wine making days, I started leaving recipes behind. Each week, I’d go the the local farmers market and buy whatever looked good. During the week I’d experiment and cook from the heart based on the ingredients I had in the house. It was liberating and so much fun! Thankfully, the art of adaptation is a skill that anyone can learn. I’ve helped hundreds of cooks like you make the transition. And you can take baby steps to get there. If you join us for ‘The Healthy Meal Method’, you’ll discover all the tools you need along with 10 of my favourite most ‘adaptable’ recipes which will give you a starting point or ‘training wheels’ to help you flex your own adaptation muscles. With time you too will be able to cook with what you have. Martha, Healthy Meal Method Student. Roast broccoli is one of my all time favourite things to eat. I’d take it over roast spuds any day (although the men in my house are firmly in the potato camp). It’s especially tasty when cooked in a hot oven like this because you get the lovely charred crispy bits on the outside. Plus its quicker to cook. So even if you’re not a Caesar fan, I really encourage you to try the broccoli! 1. Preheat your oven to 250C (480F). Chop broccoli into bite sized little trees and finely slice broccoli stems. Slice each chicken thigh into 4 strips. 2. Place broccoli and chicken in a roasting pan and drizzle with a little oil. 3. Pop in the oven and cook for 10 minutes. 4. Meanwhile, combine lemon, mayo and grated parmesan in a medium bowl to make the dressing. Taste and season with salt and pepper. 5. After the 10 minutes, stir the chicken and brocc to move the outside pieces into the middle so everything cooks a bit more evenly. 6. Roast for another 5 – 10 minutes or until chicken is cooked through and broccoli is tender. 7. Toss hot chicken and veg in the dressing. 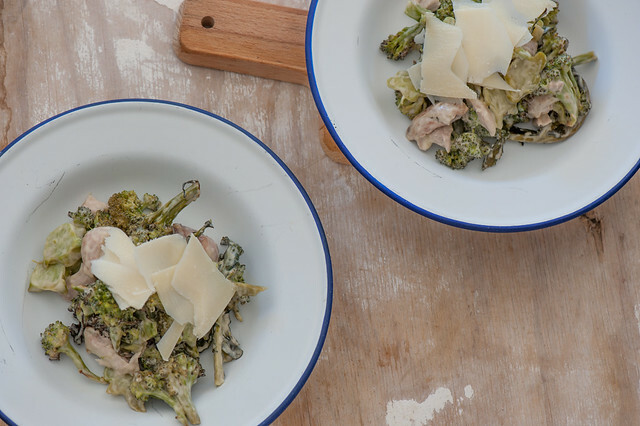 Divide between two plates and serve with extra shaved parmesan on top. mayo-free – replace mayo with extra virgin olive oil, sour cream or natural yoghurt. vegetarian – skip the chicken and serve with a poached or boiled egg instead. Or toss in drained canned or cooked white beans or chickpeas. more veg – toss in chopped cos or romaine lettuce, baby spinach, finely chopped raw kale or fresh parsley leaves. 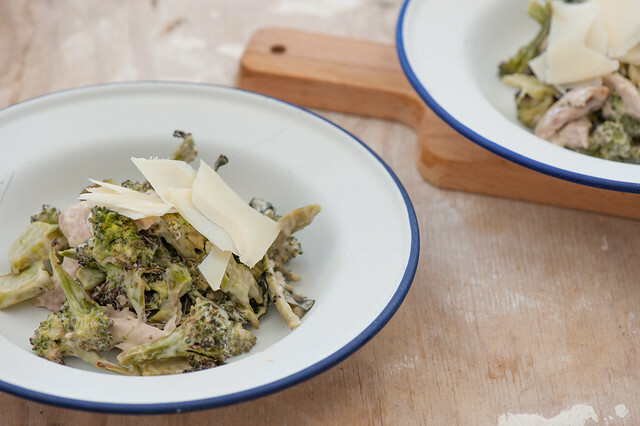 more classic Caesar – replace roast broccoli with chopped Cos or Romaine lettuce. And add some chopped anchovies to the dressing. carb-lovers / more substantial – toss in cooked pasta, cooked chickpeas or torn chunks of sourdough bread. dairy-free / paleo – replace grated parmesan with grated brazil nuts and replace shaved parmesan with roast almonds or pine nuts. ps. I’d love to hear from you. What are your biggest struggles when it comes to healthy cooking? Let me know in the comments below. I will definitely try the roasted broccoli and maybe that Caesar version you’ve laid out. As you say Jules, we have to commit to trying something new, not just reading recipes! I’ll be making one or more of your 10-Ingredient shopping lists in the next week. Will comment after I’ve tried. Thanks for all you do! Fergal isn’t a sauce man either Laurie! 1. Precook and portion/freeze meals for work and other stressful days on weekends (mostly stews and soups). 2. Stock non-perishable things such as beans/lentils, canned tomatoes, tuna etc. to turn into quick meals with a side of eggs or some fresh parsley. But the precooking really is the best thing – I usually choose one or two recipes, of which at least one can be prepared in a slowcooker, portion them and put them in the freezer (labelled! – learning that took me a while and plenty of “food surprise” days) os I can just grab something when I head out to work. Otherwise I would definitely order takeout way more often. I’ve been wanting to make this recipe ever since I received your email. Last night it made it to our table. Yum! I added a sprinkle of garlic powder, but that’s the only change. Served with a tossed salad and some steamed spinach. This will become a regular in our house!